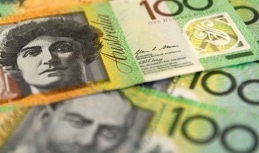 The Australian dollar has increased against the US dollar offsetting the previous losses. The Australian-to-US dollar exchange rate stands at some 0.7146. Beijing has released a pack of economic reports today. The key interest arouses in the Q3 GDP figures – the rate increased by 6.5% (forecast – 6.5%; Q2 level – 6.7%). Thus, the slowdown was expected but not so big. China's industrial production rose just by 5.8% y-o-y in September (6.0%; 6.1%). At the same time, positive news came from retail sales which hiked by 9.2% y-o-y over the period under review, exceeding the anticipated level. The labour market also showed better performance – China's unemployment rate improved to 4.9% (5.0% earlier). The Eurostat September inflation report has hardly surprised the market. Specifically, the euro area inflation in September came in line with the forecasts voiced in the market. 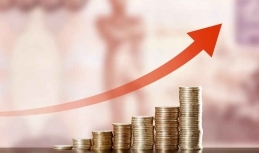 The rate increased by 2.1% y-o-y over the period under review. In September, consumer prices rose at the August pace. However, core inflation in September added only 0.9% in September, as it was recorded in August. In this context, the market expectations regarding the changes failed to come true – analysts anticipated an increase of 1%. The core CPI does not include hiking prices for power sources and food, including alcoholic. This means that the September inflation was mainly driven by the prices for energy sources, which is quite natural given more expensive petroleum and other fuel in the euro area in September (9.5% up y-o-y) amid soaring oil quotes. Spain and Germany gained the palm in terms of the September inflation: CPI rose 2.3% and 2.2% y-o-y respectively. At the same time, some other euro-area countries (Italy and France particularly) posted slower inflation over the same period. Non-commercial traders raised net short positions by 12,000 contracts to 18,700. Large speculators have been expanding short positions for the second week. Net short positions have peaked since April 2018. Commercial traders decreased net long position on EUR/USD contracts by 6,100 to 3,800. They have lowered positions for the second week after an almost 4-week increase. Open interest dropped by some by 2,200 to 553,300 contracts. Bearish index of large speculators (short and long positions) amounts to 0.08 to 1.12 over the period under review. Non-commercial traders raised net short position for bitcoin contracts 80 to 1,370. Large speculators have been raising net short positions for the second week after an almost 9-week decline. Two weeks ago, the net position hit an all-time low since last December when futures trading started. As for nonreportable positions, net long positions on bitcoin contracts hiked by 80 to 1,370. Besides, they have been ramping up positions for the second week in a row as well. Commercial traders that usually sell against the main trend, did not take part in trading over the period under review. Open interest dropped by some 40 to 4,030 contracts. Bullish index of large speculators (short and long positions) decreased 0.03 to 1.74 over the period under review. 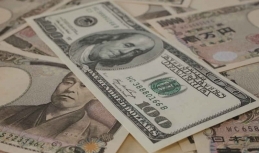 This summer the US dollar-to-yen exchange rate restored ratio with the interest rates. Seeing sluggish Japanese currency, Nikkei hiked by almost 2,000 points in September. However, the yen has lost support that came from the previous upturns given the recent weakening of the sentiments towards the risk. It seems that the Japanese abeconomics no longer has a strong impact along with the general market volatility and signs of real market slackening. The Japanese economy has shown signs of a slowdown in the main sectors just after the Tankan release this September. In this situation, export orders can be the only positive news in Japan. There are some guesses in the market that Japan may revise its economic policy tools after completing its soft policy and switching to its normalization. Nevertheless, slower upturn and increased inflation indicate that the market will eventually see no changes. The fact that Shinzo Abe won the Prime Minister chair for the second term indicates that the abeconomcs will be followed further. Risk demand has kept falling on Thursday. The market is facing sell-offs on all fronts. The global stock indices, oil, US dollar and US Treasuries have dropped today. Specifically, the charts show that the Shanghai composite index slumped by 5.22%, followed by Nikkei – 3.89 % down. It seems that the market experiences massive selloffs rather than traditional risk aversion. The observed situation can be probably connected with increasing inflation in the USA. 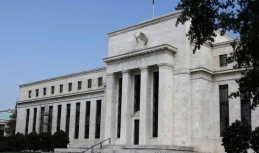 Inflation fueled by stable economic upturn will make US Fed revise the interest rate. Moreover, Donald Trump hardly supports the market making aggressive statements saying the US Fed is responsible for that stock market downturn. 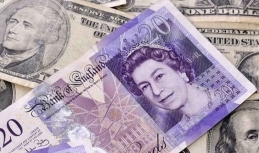 The sterling has posted gains against the US dollar in the mid-week. 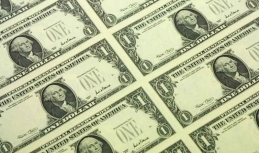 At present, the sterling-to-US dollar exchange rate stands at $1.3183. According to the released data, industrial production rose by 0.2% m-o-m in August (0.4% upturn in July). The processing sector recorded a 0.2% decline, while the previous forecasts covered a 0.1% upturn. Construction sector plunged by 0.7% m-o-m against the anticipated weakening by 0.4% m-o-m. As for Brexit, the Labour Party, in particular, 30-40 members, reportedly can vote for the Brexit deal, which could lend good support to UK's Prime minister Theresa May. Specifically, Theresa May has reportedly managed to win the backing of 315 MPs. However, some from this list can stand against the deal due to intraparty clashes (this is about the officials that are in May's party but disagree with her Brexit plan). The players were getting rid of Chinese stocks at the start of the week indicating stronger concerns in the market. Market fears were fueled by a recent increase of interest rate by US Federal Reserve, greenback's hikes, slower economic activity and US-China tensions, with extra pessimism coming from the PBOC which downgraded reserve requirements for banks as a way to maintain credit. This reflects the need for tougher steps to avoid a collapse. As of today, China's stock market improved somewhat, and now the players keep track of the Chinese yuan. 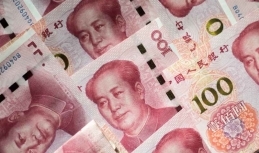 The US dollar-to-yuan rate attempted to break the 6.93 handle again, whereas the price fixing was at 6.898. Thus, now the next point is the period when the rate touches a psychological level at 7. In the USA, the White House may probably define Beijing's move as a deliberate yuan downgrading by 9% over the past 6 months to get a jump in the war. At present, traders may monitor the changes of US Treasuries, especially on the yesterday's day off due to the Columbus Day celebration. 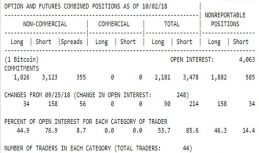 Non-commercial traders sold out all net short positions (7,500 contracts) and opened long positions for 6,700 contracts. Net position fell into the red after being a month in the black. Long positions were above the August level hitting the peak since early August. Commercial traders decreased net long position on EUR/USD contracts by 28,200 to 9,900. They have lowered positions after a 4-week increase. Net position started decreasing from the August peaks. 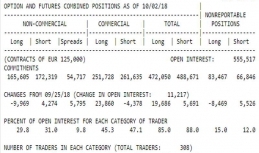 Open interest dropped by some 11,200 to 555,500 contracts. Non-commercial traders raised net short position for bitcoin contracts 120 to 1,300. Large speculators have expanded net positions after a 6-week decline over the past 9 weeks. The net position has recovered from the bottom since the start of futures trading last December. As for nonreportable positions, net long positions on bitcoin contracts hiked by 80 to 1,320. Open interest dropped by some 250 to 4,060 contracts. Bullish index of large speculators (short and long positions) decreased 0.06 to 1.71 over the period under review. 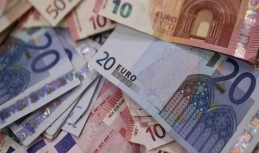 The US dollar is reportedly enjoyed better demand during the European trading session. Specifically, market speculators raised buying for Australian dollar following the decision of the Reserve Bank of Australia, which plans to leave the monetary policy unchanged for the rest of 2018.